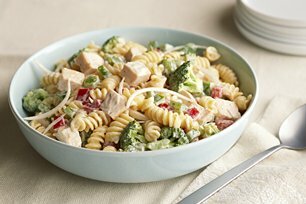 Ranch dressing flavours this tasty side salad of pasta, broccoli, peppers and chicken. It’s the perfect pasta salad for picnics or potlucks. Toss pasta with vegetables and chicken in large bowl. Stir in 1 cup of your favourite Kraft Shredded Cheese just before serving. This is a beautiful salad to take on a springtime picnic or other party! It also can be easily doubled for larger groups.